Francis Marion Mitchell and his brothers, John and William H, all served in the 1st Alabama. Francis Mitchell married Mary K. Hallmark on or about December 30, 1855 at Robert Hallmark's in Marion Co., AL. Their children were: Martha Malinda, born October 2, 1856 and John Marion, born March 30, 1858. 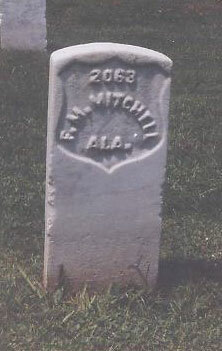 Francis was born about 1832 in SC (military records state St. Clair Co., AL) and was the son of James and Malinda South Mitchell.